I live and pastor in the Twin Cities, so I get somewhat of a front row seat to two very opposite biblical scholars/pastors: Greg Boyd and John Piper. The big Open Theism debate of several years features these two heavy weights. Ironically, I love both of them for their ability to communicate the Scriptures. 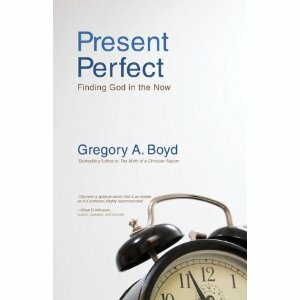 Greg Boyd’s latest book, Present Perfect: Finding God in the Now veers off from Boyd’s instructional style. It is mystical. He takes the writings and spiritual practices of J.P. de Caussade, Frank Laubach, and Brother Lawrence and puts them in modern meditations. They are his own meditations as he has tried for over 20 years to bring the practice of the presence of God into his own life. This is not a book for speed readers. It is to be taken slowly. Very slowly. Practice it. Find those times when you can digest a chapter, then put it into practice. This is not about method. It is about being aware. Do not compartmentalize your life. (“Oh, I’ve had my devotions, now I will run off to work and forget what I just read.”) This is a challenge to be aware of the very presence of God at any given moment in your day. This is a refreshing read. Books on spiritual formation are like water on parched ground for me. I soak them up. I get tired of the mental gymnastics of a lot of theological books. (I love them, but my brain isn’t geared to run that way all the time.) We need a holisitic approach to our lives again. Don’t “do” devotions. Don’t “exegete” a text. It’s not just about someone examining the text. It is allowing the text to examine them. What is your hurry? Boyd’s call is to celebrate the moment. This moment. Sense God here. Now. What’s your hurry. Are you awake? God is there. Do you see it? If you are looking for Boyd’s tough apologetic style, it’s there… in the appendix. He defends this book against claims of being like Eckhart Tolle. It’s good reading, too. But, really. Take a break from your intellectual idolatry. Rest. Find God here. Now. Breathe. Thanks for the review. I downloaded a sample from iBooks on my iPad and just read the introduction. Between your review and the intro, I went ahead and bought the book. It’s amazing to be able to purchase books so quickly. So the book is available through iBooks? Amazing. Yeah, pretty amazing. Zondervan is working close with iBooks so I figure this being a new release it would be there and Boyd is a popular writer. Sure enough it was. I got an email from Greg’s blog on this one when it was in its making, and when it was finished and on the market. He was grand in telling how it all began, what its about, etc. And Dan, you are right, it is good to put our brainiac mode to rest, and soak in the mysteries of God and His presence in the silence and the space between the breathing , God will be there. I am going to get this book. (actual one, not in ibook form). and i am glad you mentioned about his defending against it being like eckhart tolle, who i am very leary and in disagreement on.